BIT LY Shortener is a free Windows 8 URL Shortener app that lets you shorten a URL with just a single click. Using this one-step tool, you can shorten any URL with ease. The app automatically copies the shortened URL to your clipboard. So, you can paste it anywhere you want. 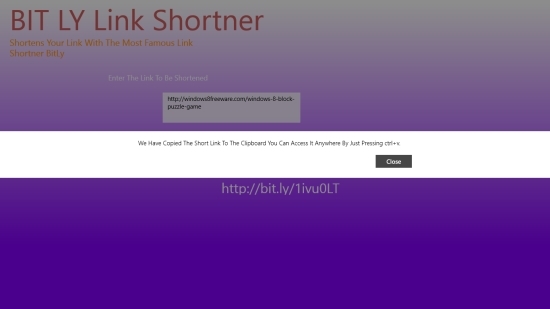 This free Windows 8 URL Shortener app is a single screen app. It is extremely lightweight and instantly makes your URL short. The app’s interface is also very clean and smooth. BIT LY Shortener is freely available in Tools category of Windows Store. You can view the app directly in Windows Store by clicking at the link given below. Let’s have a look at how to use the app to shorten a URL. As I said, BIT LY Shortener provides a one-step solution to shorten any URL. To use the app, all you need to do is to install and launch the app on your Windows 8 system. As you land on the app’s main page, you will see a textbox where the desired URL (to be shortened) has to be entered. You can copy the desired URL and paste in the specified textbox in the app. Then press ‘Shorten My Link’ button placed below the textbox. You have done your bit. Now, let the app do the rest for you. The shortened URL will be instantly displayed on the screen. The app will also flash a message that it has saved your shortened URL to the Clipboard and you can access it from there anytime by pressing Ctrl+V key combination. 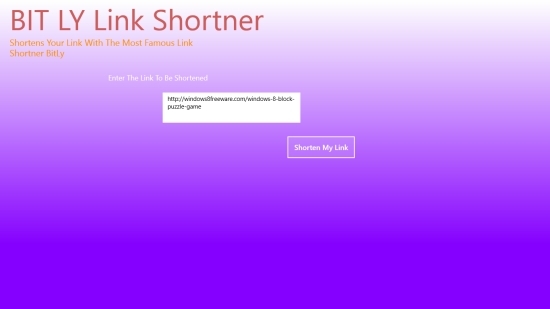 Also check some other Windows 8 URL shortener apps we reviewed earlier. BIT LY Shortener is an extremely simple application that shortens a given URL with just a single click. Give it a try and share your feedback via comments. Don’t forget to try some free Windows 8 Timer apps reviewed by us.